Squeezed between two much larger rivals who looked at its territory with hungry eyes, Poland was dealt perhaps the worst hand in all of World War II. Yet through it all, the Polish people fought for their freedom with determination and honor, paying the highest price of any country in the global conflict. 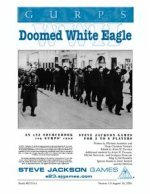 GURPS WWII: Doomed White Eagle gives you everything you need to know to play Polish characters in a WWII roleplaying campaign, or to use them as NPCs. Whether on the Eastern Front, joining Soviet forces they had only recently fought, fleeing to Allied-held territory in hopes of regrouping and striking back against the Germans, or staying home and playing a deadly cat-and-mouse game as a resistance fighter against the Nazi occupation, Doomed White Eagle has all the WWII adventure you can handle.